UK-based CNH Industrial has launched variants of its 6 x 4 Iveco Trakker range with automatic manual transmission ZF EuroTronic. The launch took place during a test drive event with its UAE distributor, Saeed Mohammed Al Ghandi & Sons (SMAG), attended by SMAG’s managing director Buti Saeed Al Ghandi and chief executive Graham Turner. Long-adopted by fleets in Europe and commanding a market share of up to 70 per cent, automatic manual technology delivers demonstrable cost savings by extending the clutch life, preventing over-revving, holding the vehicles on hills and freeing the operator to always keep two hands on the wheel. Luca Sra, business director for Iveco in the Middle East and Africa, noted: “I personally faced the introduction of the automatic transmission in off-road applications in the Italian market some 10 years ago. There was reluctance in the beginning because of the belief that manual was better. The Iveco Trakker is not the first instance of an automatic manual transmission on a heavy truck in the region, but it is a first for the brand and it is hoped that the introduction will continue to contribute towards the company’s already strong growth. 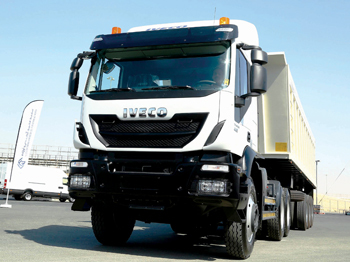 Over the past three years, Iveco as a whole has achieved a combined annual growth rate of 30 per cent. At the Dubai event, participants had the opportunity to experience Trakker EuroTronic’s cab and the vehicle’s driving performance on the Autodrome race track. The selection of Trakker variants highlighted the total flexibility of the range. The star of the launch, the Trakker EuroTronic, was flanked by four Trakker AD380 models in different configurations: tipper, compactor, water tanker and mixer. Similar units were also made available for test driving. Additionally, the company showcased a complete line-up of its medium and light vehicle ranges, with Eurocargo and Daily in different configurations. “The Trakker was designed to meet customers’ needs for strength and reliability in all extreme off-road missions with a Gross Vehicle Weight ranging from 18 to 70 tonnes and Gross Combination Weight up to 70 tonnes. The EuroTronic automated gearbox offers significant advantages, Iveco said. It can be used in full or semi-automatic mode. The automatic gearshift is calculated according to load and road conditions and driving style, so that vehicle performance, fuel consumption and comfort are optimised. The gear speeds are synchronised by electronic adaptation of the engine speed, which is much faster than synchronisation by friction. This is ideal in construction sites where the vehicle has to climb as the loss of speed is minimal. If the driver wishes to maintain the same ratio over a difficult stretch, he can switch over to semiautomatic mode to control the gear changes. With EuroTronic, the driver can focus entirely on driving with there being no need to take the hands off the steering wheel, and the vehicle is performing at its most efficient at all times, said Iveco. The result is high comfort and reduced fatigue for the driver, as well as great fuel efficiency and low operating costs, in other words, safety and profitability, it added. With the introduction of the Eurotronic gear box, the Trakker range is wider than ever, boasting a product offering that allows customers to tailor the product to their specific mission. The range includes the Cursor 13 engines and two cabins (Hi-Land and Hi-Track). Rigid truck versions are available in 4x2, 4x4, 6x4, 6x6, 8x4 and 8x8 configurations with power ratings from 380 hp to 440 hp. Tractor versions are available in 4x2, 4x4, 6x4 and 6x6 configurations with power ratings from 380 hp to 440 hp.